LibertySlots.eu is a new online casino that became immediately popular when it launched last fall and brought back very popular online casino games like Agent Cash, Reel Deal and Cleopatra’s Pyramid that were no longer available anywhere else. 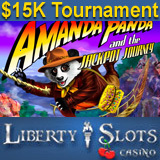 This month it's hosting a month-long slots tournament on its new Amanda Panda: Jackpot Journey slot machine game that will award a total of $15,000 in prize money. Amanda Panda: Jackpot Journey is a brand new game with an explorer theme featuring free spins and a purse-toting lady Panda as its swashbuckling heroine. Its “Jackpot Journey” scatter symbol triggers 10 free spins. Before the bonus round begins, a row of ceremonial shields appears, each with a bet multiplier hidden value under it. Players choose a shield to reveal multipliers up to x5. The $15,000 Jackpot Journey Slots Tournament begins August 1st and players have until August 31st to achieve the highest score of the month on the new game. The entry fee is $5 and players get $300 to play with. Details of this as well as a list of daily slots tournaments can be found on the Tournaments tab at LibertySlots.eu. “Tournaments give players a chance to win big money without much risk,” said George Jones, manager of Liberty Slots Casino. Liberty Slots offers more than a hundred slot machines and casino games including blackjack, roulette and craps and hosts daily slots tournaments. Attentive customer service is available around the clock, seven days a week via toll-free phone, email, live chat and even by Skype.